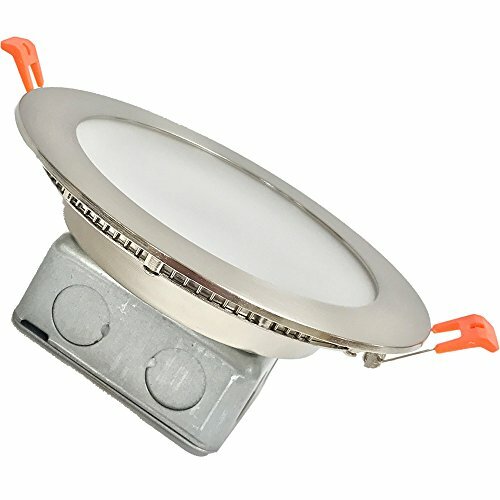 Our incredibly bright, thin, low profile, LED drywall disc lights are the perfect addition to your living room, dining room, basement, closet, home theater, kitchen or hallway. A simple, almost flat design, allows you to install these ceiling lights flush with the ceiling with minimal housing on the back. No external drivers or high hat cans to install. Our design is one of the thinnest available with the integrated driver right on the fixture. 2 7/8" total depth with an outside ring diameter of 6 3/4" and the interior light portion of 5". We don't require the separate bulky driver that needs to be stuffed into the ceiling like competitors models. A range of sizes and colors allows you to use these lights in many settings by themselves or placed throughout a room in clusters. A beautiful brushed nickel finis, slim, flush mounted, bracket, holds a frosted poly-carbonate cover, that encapsulates the Cool 4000K 12w LED lights. Sealed from bugs and shatter resistant with no UV emitted. The 4 inch disc light emits 800 lumens with a CRI > 85. A lifetime of over 50,000 hours in this dimmable fixture is highly energy efficient with energy savings of approximately 85%. A simple 3 wire install makes it safe an easy to install. The standard J box is attached to the fixture with standard sized knockouts to daisy chain. 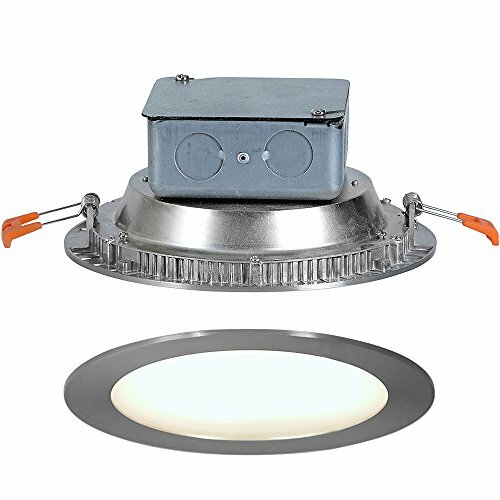 Suitable for a damp environment, our flush ceiling lights are ETL certified to UL Std. 1958. Type IC and Non-IC rated. We stand by our products and your happiness with a 100% money back guarantee. A USA Company with 3 Generations of Family Values. SOPHISTICATED DESIGN: Clean Modern, slim, low profile, LED high hat alternative integrated disc lights for ceilings with beautiful lines and impressive light output. One of the thinnest on the market, with no exterior loose driver. 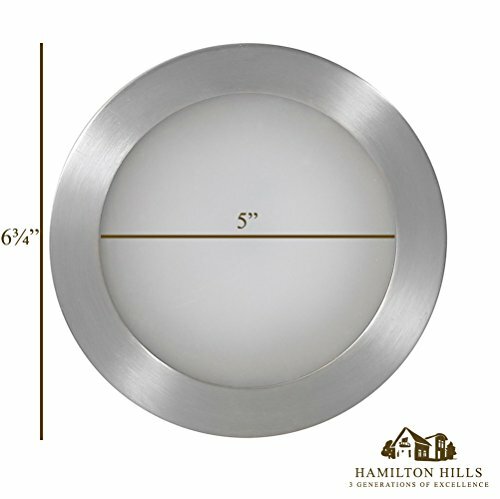 A slim brushed nickel ring surrounds a frosted glare free polycarbonate lens for even light distribution with exceptional color accuracy over 85 CRI . Cool 4000K LED lights offering a bright white-light. SAFE AND EASY TO INSTALL: Our dimmable lights are ETL Certified. Standard J box with 8 x 3/4" knockouts to direct wire to 120V AC. No additional cans or mounting hardware needed. 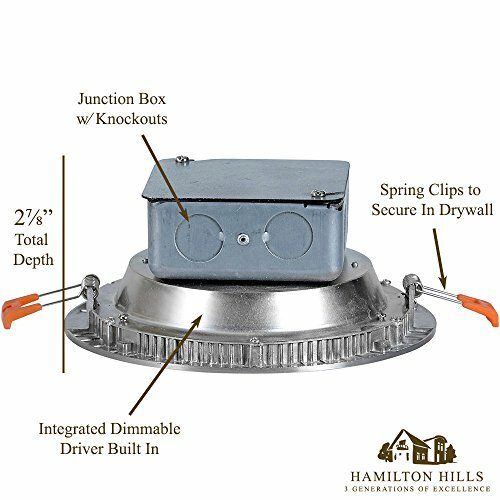 Easy durable spring loaded clips to secure light in drywall. Shatter proof lens with no down heat emission and energy efficient with 50,000 hours lifetime. Instant on, no flicker, no UV, mercury free light. 12W, 800 Lumens, 120V. 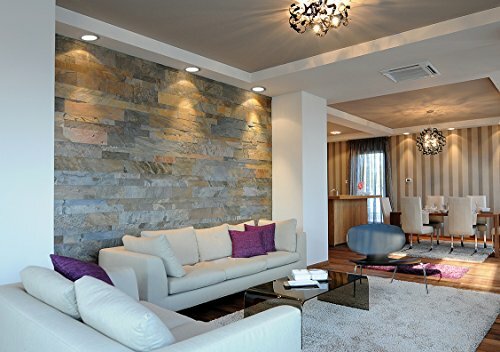 Use conventional LED dimmers. Standard three wire install in dry or damp locations. 3 GENERATIONS OF EXCELLENCE: Our family has been manufacturing and producing household fixtures and decorative pieces for over 3 generations. We stand by the quality of our product and your experience. A family owned business with simple principles. Affordable quality in America with a Money Back Guarantee. EXCEPTIONAL QUALITY: We use premium materials not found in other lesser quality imitation lights you will see. Our lights are made to strict trade-secret standards and pass a rigorous 8 point inspection. 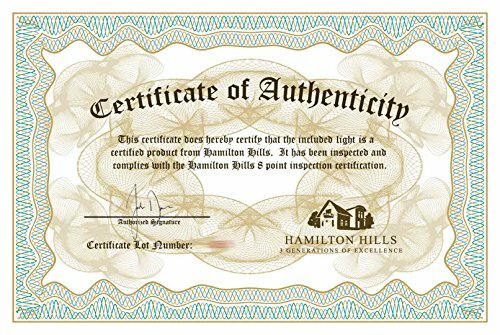 Every light comes with our certification of authenticity and are certified to nationally recognized standards for safety. 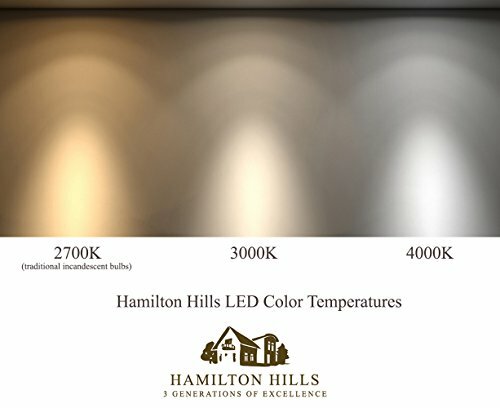 100% MONEY BACK GUARANTEE: Order our Hamilton Hills light and see for yourself. If you don't absolutely love our product, let us know and receive a full, no questions asked refund. We are a family owned business that stands by your happiness.